Born in 1978 in Tokyo. He reported the Beijing Paralympics in 2008 using the D3, the London Olympics and Paralympics in 2012 with the D4, and the Rio de Janeiro Olympics in 2016 with the D5. 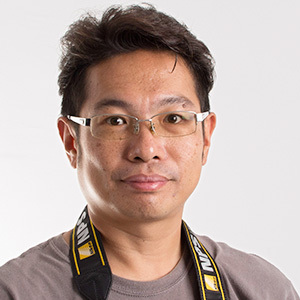 He is an official photographer of the National Olympic Committee of Thailand. 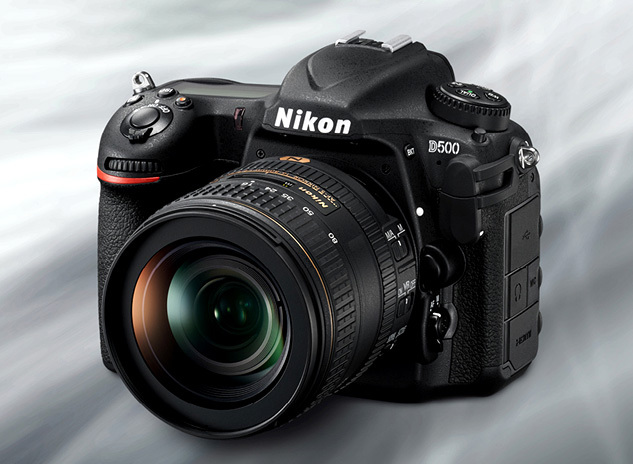 What overall sense do you feel when using the D500? My first impression of the D500 was that, as might be expected of an APS-C size flagship model, I would be able to use it with great ease. And the more I handle it, the more it seems to fit in my hands, giving me a feeling of trust as if, "this is the camera I've always wanted." Since its grip is slightly smaller than that of the full-size model, the D5, it's comfortable for a person with small hands like me to hold. By customizing each setting, I can get closer to achieving my own shooting style, so now this camera is a must for me. What do you think about the AF speed? I received the impression that it took a little longer for initial focusing compared with the D5, however, AF tracking accuracy is quite good. There is no problem if I take enough time to shoot, but when I am in a hurry, I feel like the camera slightly reproves me as if saying, "Hey, you'd better prepare for shooting". How about the AF accuracy? I feel that once the D500 acquires a subject, it doesn't let it go. For erratically moving subjects or sports with multiple players, it's possible to enhance AF accuracy by finely adjusting AF lock-on settings. Although the default setting is good enough to shoot sports, AF can be made even more reliable by changing the settings according to the genre. Regarding AF-area modes and AF lock-on, which settings are more effective for which sports? 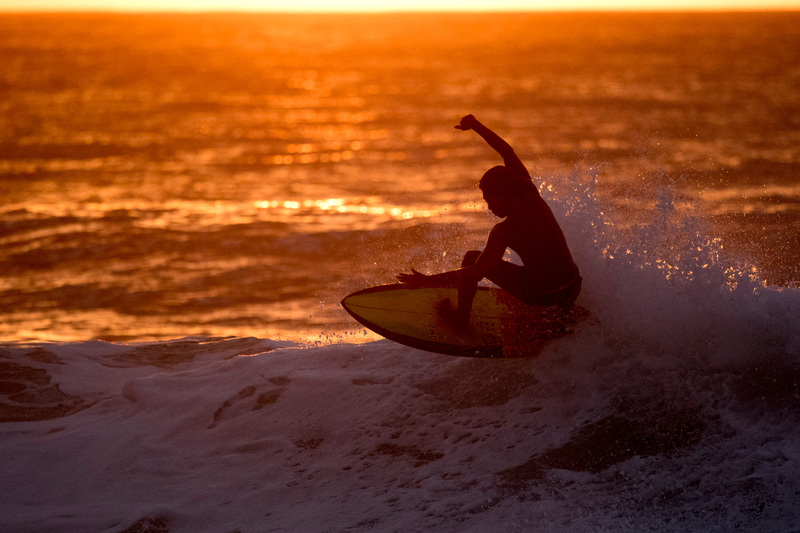 I choose settings according to the look of the images I want or the shooting style, rather than the genre of sports. I have tried 3D-tracking since shooting with the D3, but I somehow felt that the function did not work quite as well as I expected sometimes. With the D500, the accuracy of the 3D-tracking has been further enhanced, therefore I use it for most of my shooting. The D500's focus points cover almost the entire image area, realizing more exciting composition. When shooting a swimmer, the camera tends to focus on splashing water rather than the subject. But once I focus on a swimmer's face appearing from the water surface, the 3D-tracking follows it, allowing me to concentrate on shooting without worrying about focus shifting from the subject. However, there is a minor problem. 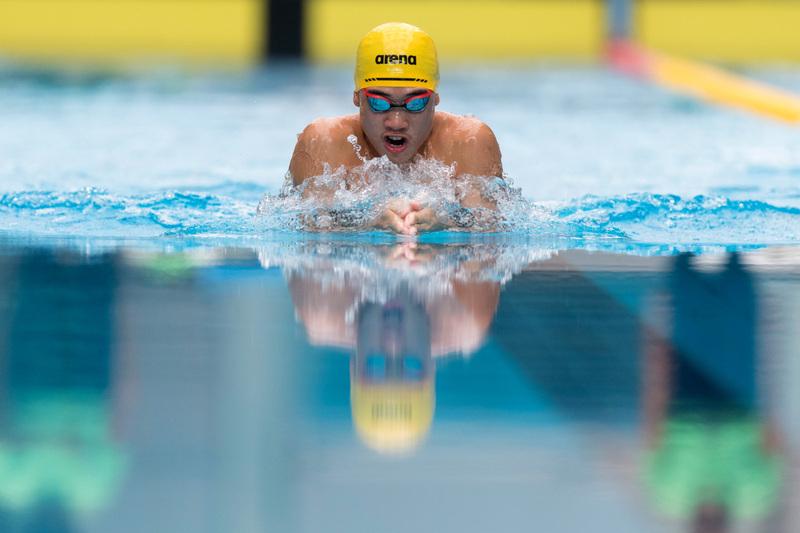 If a swimmer is wearing a white cap, it sometimes tracks the white of the cap and does not track the face very well. If this happens, I need to focus on the swimmer's goggles. 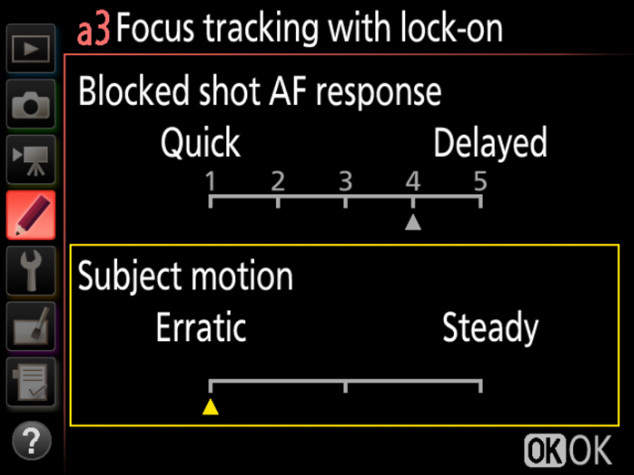 Regarding the AF lock-on function, I mainly set "Steady" for "Subject motion" when a subject's movement is predictable such as during a track race, and "Erratic" for other cases. Also, I choose 4 or 5 for "Blocked shot AF response" when shooting team games, where an obstacle is more likely to pass between a subject and the camera, while selecting 1 to 3 for individual sports or similar situations. How about the performance of auto-area AF? I assign auto-area AF mode to a custom button. This is convenient, for example, when I want to capture a nearby player up close while I'm shooting a relatively distant subject using one focus point or 3D-tracking. At such times, I need to change focus point to give priority to a composition, but it is quicker to use auto-area AF by pressing a custom button. However, when there are multiple players in a frame, it cannot always focus on the targeted subject, therefore, I utilize auto-area AF only when I'm sure it can be effective. I rarely employ it when shooting soccer or rugby matches. On the other hand, I normally shoot scenes involving two moving fighters, such as wrestling, taekwondo, judo and karate using auto-area AF, as it attaches importance to the subject's face. Which image quality do you use? I think many sports photographers shoot in JPEG only, but I record in NEF (RAW)+JPEG fine. Because I use an XQD memory card that features a fast writing speed, I can still perform continuous shooting even with high image quality. I often utilize JPEG images straight out of the camera rather than processing RAW data, however, I sometimes process RAW data according to the application, to bring images closer to the way I want them to look. 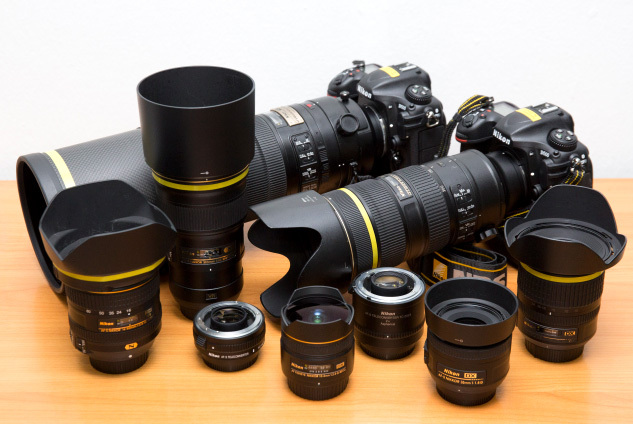 Are you satisfied with the facial tones of your subjects? Do you think it's possible to use the images without adjustment after shooting? I can make the colors of my subjects' faces and team players' uniforms appear closer to how they are actually seen because RAW data files are simultaneously recorded, but I use the original JPEG data with almost no adjusting. If color cast occurs, not because of lighting but because of reflected light from the floor, I compensate it depending on the situation. Up to what ISO sensitivity is effective? It depends, as each individual feels differently about high sensitivity noise, but personally, I think there is no problem up to ISO 6400. Above ISO 6400, I can use up to ISO 12800, considering shutter speed and the expected final image. Which white balance mode do you employ? And do you think the result is appropriate? When I shoot outdoor sports, I mostly set "Direct sunlight". In a situation where lighting quickly changes, such as during an opening or closing ceremony, I select auto white balance. I am happy with "Auto 0: Keep white (reduce warm colors)" that ensures whites appear beautifully. If auto white balance does not work well in an indoor location under mixed light sources, I sometimes use preset manual. 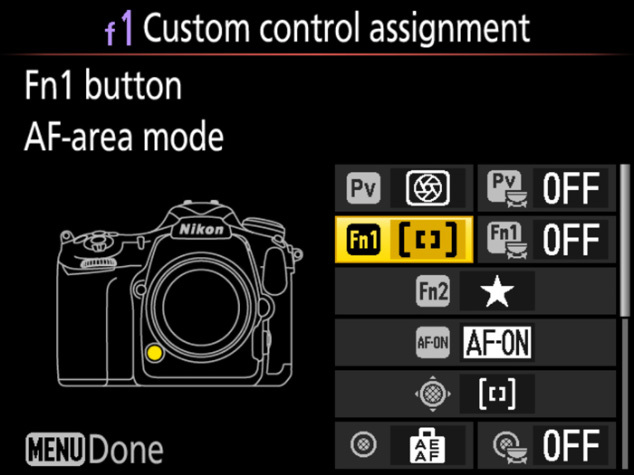 Have you used the flicker reduction function? If so, how was the effect? When I shoot indoor sports, I have always been annoyed with flicker effects. But since I started using the flicker reduction function of the D500, the resulting images have been remarkably improved. I think I cannot even tell if flicker actually occurred in the location when seeing the images. This is why I always turn on the flicker reduction function. 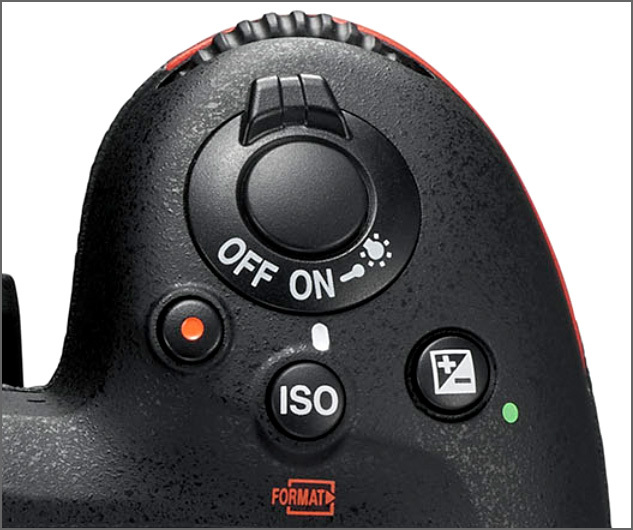 What do you think about the ISO button being newly relocated close to the shutter-release button? It is quite convenient when I have to operate the camera with my right hand, while holding a telephoto lens with my left hand. It can be accessed quickly when I need to adjust settings instantly, in conditions such as a sudden change of light. I can turn auto ISO sensitivity control on by pressing the ISO button and rotating the sub-command dial, which is also very useful for me. How often do you use the touch panel? And what do you think about it? I often use it. I zoom an image to confirm, and also, it is very helpful when I want to show images to somebody right after I take them. People can see the results they want even if they do not understand how to operate the camera. 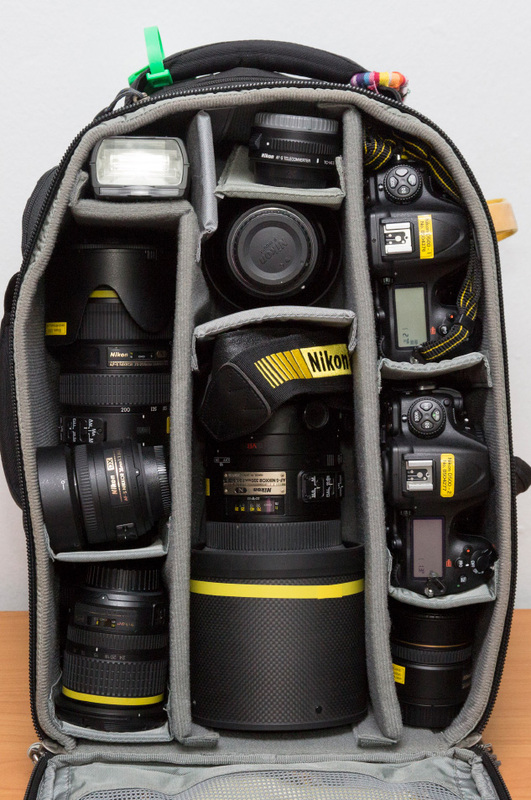 What shooting equipment do you employ?